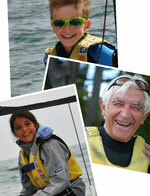 Our offer - Cap-sailing : le plaisir d'être sur l'eau ! 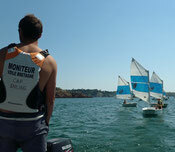 Sailing courses include 5 sessions from Monday to Friday. Each session lasts 2 or 3 hours depending on the courses. Groups are a maximum of 8 to 10 trainees for better quality teaching with certified instructors. Courses take place in a pressure-free, relaxed and fun environment ! .... Cap Sailing offers private tuitions tailored to your level of sailing experence to maximize your enjoyment and learning. On catamaran, dinghy and windsurfing. 90 €/h for 2 persons. Discount rates for 2 hours or more. Enjoy a 30' experience with an instructor in dinghy or catamaran. Maybe, you 'll want more ! Navigate 1h30 for the price of an hour for any departure before 12h30 ! For fun ... and fitness ! For fun with friends or familly ! or till 8 with kids. 420, a friendly and safe dinghy for 2 or 3. Laser, a funny and exciting dinghy ! Open Bic, a "glide" machine for teens ! Suitable for teens or solo adult. The most popular catamaran worldwide. Very exciting but not suitable for beginners !